The Rolabrader is a new tool prototype that appears to offer the versatility of an angle grinder with the ability to follow the grain like a belt sander. 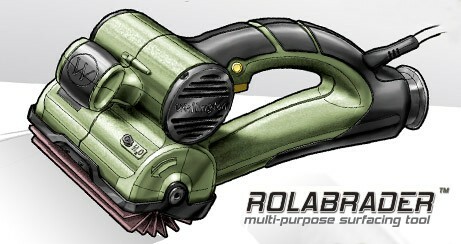 But do you have any more room left in your toolbox for yet another awesome looking tool? There are a ton of different wheels you can get for an angle grinder that allow it to do everything from grinding to polishing; but the problem with angle grinders is that they have a rather small surface area. Using wide rollers, the Rolabrader still has the versatility of an angle grinder with a number of different rollers types, but provides a larger surface area and won't leave swirly marks on your material. An included dust port also makes sure that harmful dust is taken care of. The Rolabrader is still a prototype, but their patent has been approved and they say consumer availability will be soon. There is no set price yet, but we will be keeping our eye out. Below are some videos of the prototype in action. What do you all think, is this something you would use if the price was right? Remove pealing and blistering stain and paint with the Wellington Rolabrader. Moderate work surface preparation can be easily done with no problem. You can see the first generation prototype from Wellington prepare the surface with ease. 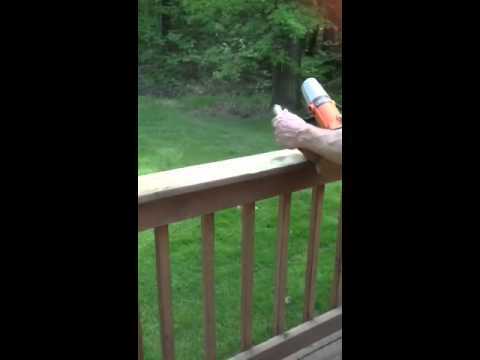 This is the first generation Rolabrader in action restoring a wood deck. Visit www.wellingtontool.com for more information.